Dual-purpose breeds have formidable egg-laying capabilities and heavy-breed configurations for meat consumption. They function well for both purposes. These are good breeds for free-ranging in your garden, and the majority of backyard flocks are made up of this group of breeds. These breeds can weigh six to eight pounds at maturity, and they aren’t able to fly well. 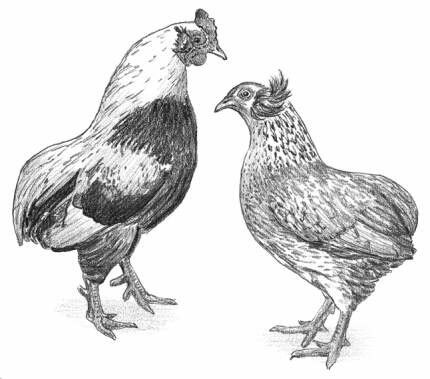 The figure shows the Barred Rock (left) and Wyandotte (right). Most of these breeds are known for their prolific egg-laying capabilities: 250 to 300 eggs per year in their first one to three egg-laying years. The figure shows Minorca (far left), white Leghorn (middle), and Hamburg (right). Popular brown egg layers include the Australorp (left) and Rhode Island Red (right). The Araucana is a popular colored egg layer. Most meat breeds have been genetically bred. They have the propensity to grow quickly and with heavy-muscling. They fall short in egg-laying, and sometimes lose their capability to efficiently reproduce on their own. Popular meat birds include Jersey Giant (left) and Cornish X Rock (right). 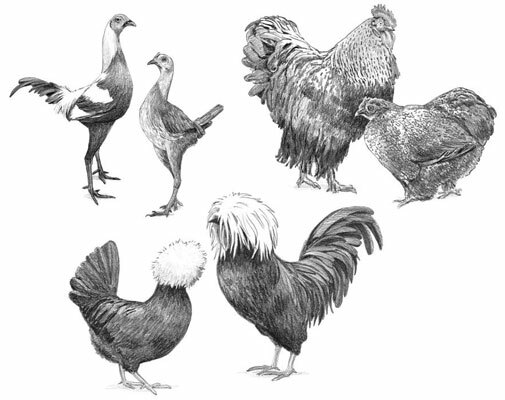 These breeds are the ornamental breeds of the chicken world. Children gravitate to these breeds, drawn to their appearance and personalities. They aren’t prolific layers, and they aren’t best for eating. The figure shows three popular show and pet breeds: Old English Game (top left), Cochin (top right), and Polish (bottom). Bantam breeds are miniature chickens, usually three pounds and under. Almost all chicken breeds have a bantam size and a standard size. If a breed has only a bantam size, it’s considered a true bantam. Bantams are perfect for urban environments, because they require less space. 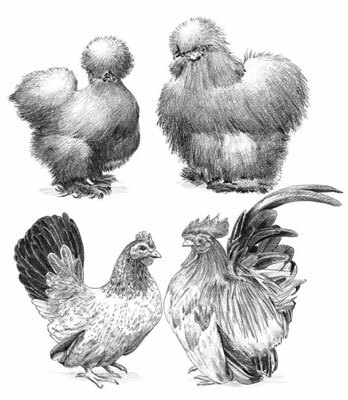 The figure shows the Silky (top) and the Japanese bantam (bottom).